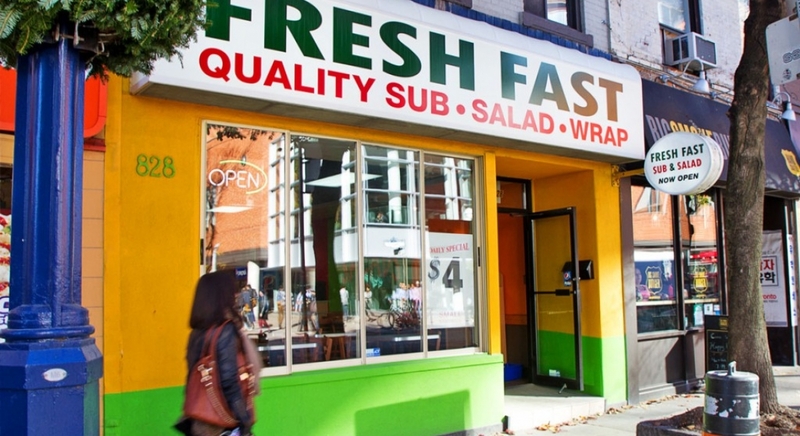 Fresh Fast is tucked between Big Smoke Burgers and Pizza Pizza on the West Side of Yonge Street just North of Bloor. This health haven serves up toasty subs, fresh salads and delicious wraps to satisfy your cravings. Choose a base for your salad like spring mix or romaine. Top it off with fresh vegetables, chicken, beef, turkey, ham, salmon, tuna or shrimp. Dress up your masterpiece with one of their many dressings like Chipotle Mayo, Tzatziki, Buffalo Sauce and Red Wine Vinaigrette. Or you can opt for one of their own creations like Spicy Shrimp made with shrimp, chipotle mayo, avocado, lime juice, romaine lettuce, and your choice of veggies. Their delicious wraps include gourmet chicken, beef steak, seafood and signature items. The Salmon Milanese is made with spinach mix, salmon, egg, avocado, lemon, and your choice of fresh veggies. Their standout subs feature veggie, seafood, classic and gourmet varieties. Their Veggie Guacamole is made with cheddar, mozzarella, avocado, and your choice of veggies and sauce. The Crazy Carbonara is made with chicken, melted mozzarella, cheese, Alfredo sauce and choice of veggies. Their extensive menu features something for everyone including soups, croissants, and flatbreads. There’s even a specialized vegetarian section! Stop by this sandwich shop and get rewarded $5 when you spend $50 and receive $1 off your first purchase with our mobile payment and loyalty rewards app. Our app lets you discover great locations nearby, including Balzac’s in the Toronto Reference Library and Cafe Moi for a coffee right after!